Naming a product, service, or company is not an easy task—not only must you find a name that is appropriate, but you need to make sure that no one else is using it. It must be possible to get a website address (preferably a “.com”), that is as close to the brand name as possible, so that customers can find you online. Finally, it must be possible to legally protect the name and brand. Being able to protect your brand is important to running your business. 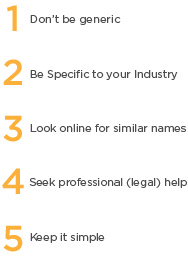 You do not want other people in the same industry or geographic area using your name. Registering the name at a State and National level helps protect the name and brand. Names that are short and with fewer syllables are easier to remember. It is possible to use a shortened name for your logo or brand mark (legally, all that is required is for the complete business name to appear somewhere on the letterhead or business cards; it could be in tiny print or off in the margins). If names are unusual (think “Indicia”), they also are more likely to be remembered. Finally, avoid the “law firm” approach to naming; either using all partners’ last names or abbreviating the name to an alphabet soup of letters is ineffective. Following these five steps for choosing a brand name can help your product or service win the Name Game, as well as the hearts and minds of customers. Of course, we still recommend consulting with an I.P. attorney prior to doing any kind of marketing or creative work for the brand—at which time we would love the opportunity to work with you!